By Maureen Martin | March 5, 2014 | Dish! Mila Kunis will make a guest appearance on an upcoming episode of Two and Half Men. She will be playing the love interest of Ashton Kutcher’s aka her fiance. Rapper Da Brat is pregnant with her first child. Lupita Nyong’o and Rihanna were front row at the Miu Miu fashion show in Paris. Lupita is the “face” of the collection. DISH! 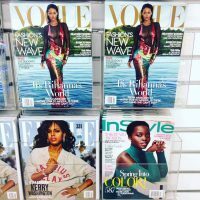 Rihanna, Lupita and Kerry: This Month’s Covergirls. Plus: Beyonce’s New Formation! DAILY DISH RHOA Kandi Expecting? Chris Brown & Rihanna Back Together? DISH! 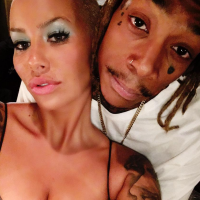 Amber Rose Reunited with Wiz Khalifa! Rihanna Revealed Her Thoughts on Rumors! DISH! Rihanna Shows Drake What He’s Missing!